December « 2015 « Blog Marcos L. Mucheroni Philosophy, Noosphere and Ciberculture. As we know that this historical fact is true, that a boy was born in Bethlehem and that in fact this happened, Mary and Joseph should go to Bethlehem birthplace of Joseph because a census was being conducted and each resident of Judea should go to their homeland . The second historical signal is also divine, because the fact that the Messiah was due to the Bethlehem of Judea, as written by the prophet Micah: “But thou, Bethlehem Ephratah, though thou be little among the thousands of Judah, out of you will come for what ruler in Israel; whose goings forth have been from of old, from the days of eternity “(Bible, Micah 5: 2). “It happened in those days that a decree went out from Caesar Augustus that all the world should be taxed. (This first enrollment made when Quirinius was governor of Syria). And all went to be taxed, every one into his own cidade.E Joseph also went up from Galilee, from the city of Nazareth, into Judaea, unto the city of David called Bethlehem (because he was of the house and lineage of David). To taxed with Mary his espoused wife, who was pregnant “(Luke 2: 1-5). “He got up, however, a member of the Grand Council. Was Gamaliel, a Pharisee, lawyer, respected by all the people. He ordered them to leave these men for a moment, then said, Ye men of Israel, and consider what you going to do with these homens.Faz some time appeared a certain Theudas, who considered himself a great man. The he joined about four hundred men, was killed and all his followers were dispersed and came to nothing. After this, he rose up Judas of Galilee in the days of the enrollment, and drew with you people, but he also perished and all who followed him were scattered “(Bible, Acts 5: 34-37). Are events that occurred after the death [and resurrection] of Jesus, so after the year 3 AD, then the historian Josephus is right and Luke, too, but it is known that the fact calendar suffered interference dates when their institutionalization by Julius Caesar, in 46 BC, according to historian, there was a shift of three years, then give the 6 AD Josephus refers. The historical fact, Bible prophecy saying that the Messiah would be born in Bethlehem, which would come from the seed of David (Joseph went to Bethlehem for the census because David was there), that a virgin would conceive and the fact that two censuses were conducted in that period, show the historical figure of Jesus’ birth, maybe the date is not 25, though it is a birth that should be celebrated by all teaching that brought this divine boy. 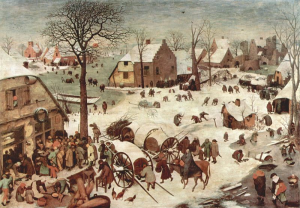 Up Pieter Brueghel frame the Elder – Census of Bethlehem: 1566.